March is Social Work Month, and as always, it is a time to focus attention on the contributions of social workers in every aspect of society and educate on why they are so valuable to the well-being of individuals, families, and communities. This year’s theme, “Elevate Social Work,” reflects that goal and by doing so, supports why raising social workers’ salaries is so important. Despite the vital work that social workers do, their salaries are not comparable to those of other helping professionals including psychologists, registered nurses, and police, to name just a few. Fair compensation for social workers has long been an issue in the profession, and this year, hopefully, through increased self-advocacy and public support and understanding, we can start to change this longstanding professional inequity. Responding to the growth of virtual learning, social media, and interprofessional collaboration, social work educators are also innovating in field placements. In the feature on field education in changing times, educators describe how video calls, telehealth, and virtual meeting mediums are models for virtual placements for social work interns. 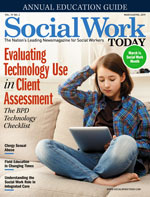 Social work educators have also developed the Social Media Toolkit for Social Work Field Educators, a resource that offers educators and agency staff research-informed tools to help inform students and staff how to navigate ethical dilemmas often associated with social media use in professional settings. Lastly, reflecting the increase in the interprofessional dynamic with other disciplines, field programs are now providing opportunities for interprofessional education to students through the use of simulation, interprofessional field placements, and partnerships within a college or university system. Every day, social workers are elevating their profession through innovation in practice and education.